I briefly discussed aerosols and droplets in my first Ebola post, but because there is still so much online discussion about Ebola transmission and because it's relevant to all infectious diseases, I decided to move that section of the post here and expand upon it so that those interested specifically in this topic wouldn't have to wade through the rest of that riveting post to find it (although I highly recommend it). There is still some minor redundancy between the posts, but redundancy when dealing with BSL4 pathogens is a very good thing. References are listed at the end of the post. First, What Does "Airborne" Mean? Let me clarify. Bodily secretions that make it into the air from various orifices (e.g., nose, mouth) are called droplets and are classified based on size and distance traveled. The smaller the droplet, the longer it stays suspended in the air, the farther it travels and the deeper into the respiratory tract it can go upon inhalation by the person sitting down the aisle from you on the airplane. Teeny-tiny droplets (less than 5 microns) are generally referred to as "aerosols" and can be generated by a cough, a sneeze, exhaling, talking, vomiting, diarrhea, passing gas etc. Aerosols can also be generated mechanically by things like flushing a toilet, mopping, or rinsing out a bloody wash cloth. When aerosols are infectious, they transmit disease when they are inhaled by an organism and its called "aerosol transmission". When droplets are larger than 10 microns they are called "large-droplets" and if infectious, they transmit disease by inhalation if the organism being infected is close enough to inhale the particles before they settle out of the air. They can also transmit virus if someone gets showered with droplets from, for example, a sneeze, or touching a droplet that is on the surface of an object(fomite) or someone's skin and it's called "large-droplet transmission". When we say that a virus is airborne, we specifically mean it is capable of aerosol transmission via inhalation, even when not in close proximity to the source of the aerosol. For example, someone two aisles over at the market has the measles and coughs up a lung. When you get into that aisle you inhale the teeny aerosol droplets that are still hanging out in the air and they begin depositing virus particles in your respiratory tract. These particles then enter your cells and begin to replicate. You are infected. I hope you were vaccinated! Large-droplet transmission is not considered airborne. An ebola patient sneezing directly on you will get virus particles on you, but those large droplets that landed on your lip weren't technically airborne, they settled out of the air and onto your lip fairly quickly and they weren't inhaled. If you're close enough for this, then I'm sure you are inhaling some aerosol sized droplets as well, and at this close range they are likely infectious. However, to be considered "airborne", those aerosol particles would have to remain infectious while they hang out or move through the air. Evidence indicates that while Ebola is found in the respiratory tract and theoretically could produce infectious aerosols and be airborne, for unknown reasons we don't see this happen between primates/humans in studies or in outbreaks (for detailed discussion of these studies read this post). Not all viruses can form infectious aerosols. It depends on where the virus goes in your body and what happens when it gets there. Aerosol infectivity of a virus is determined by how long the virus remains infectious in the air, how deep into the lungs it can travel, and how many virus particles are actually in each droplet compared to how many are required to actually establish an infection. If a viral infection generates aerosols containing 10 virus particles per droplet, but it takes 1000 virus particles per human cell to establish an infection, then those aerosols are not infectious, even though they contain virus. In addition, while airborne, aerosols begin to lose water content by evaporation and virus particles, especially enveloped particles like Ebola, can be affected by other environmental conditions such as humidity, air currents, and sunlight. These particles are also subject to the laws of physics and mechanical forces. 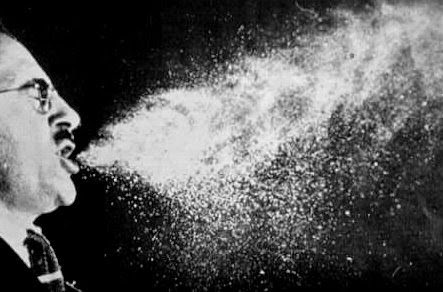 A good example of a virus for which these characteristics have been better defined is influenza and this is an excellent article that really explains the different kinds of aerosols and how they are transmitted. One question we got repeatedly during the Twitter #Ebolachat session was, "If it's not airborne, then why are health care workers not only wearing head-to-toe protective gear, but dying in spite of it?" So, although Ebola laden fluids are infectious and can transmit virus, they are not considered airborne. Larger droplets splatter and splash, even in tiny amounts and contaminate surfaces creating fomites. Puddles, droplets and fomites, in a situation with limited personnel, training and resources, are the concern. Ebola is not airborne. If it were, the casualties in this epidemic would be far higher. Please feel free to ask questions or make comments. Discussions are always welcome. Caitlin Rivers blog has a ton of links to help! Thanks Caitlin!! Tellier R. Review of aerosol transmission of influenza A virus. Emerg Infect Dis. 2006 Nov [accessed 8/12/14]. Nicas M, Nazaroff WW, Hubbard A. Toward understanding the risk of secondary airborne infection: emission of respirable pathogens. J Occup Environ Hyg. 2005;2:143–54. Knight, V. Viruses as agents of airborne contagion. Annals of the New York Academy of Sciences. 1980; 353: 147–156. Judie Alimonti, Anders Leung, Shane Jones, Jason Gren, Xiangguo Qiu, Lisa Fernando, Brittany Balcewich, Gary Wong, Ute Ströher, Allen Grolla, James Strong & Gary Kobinger. Evaluation of transmission risks associated with in vivo replication of several high containment pathogens in a biosafety level 4 laboratory. Sci Rep. 2014; Jul 25; 4:5824.
? In plain language: you sit close for some time, and you become a "probable cause". Thus airborne, without getting into semantics. 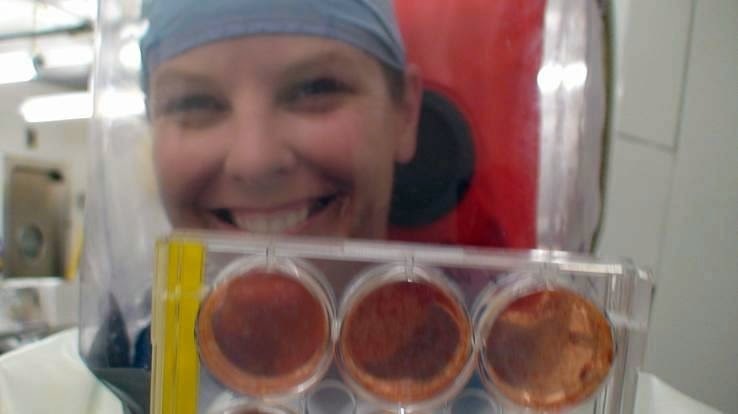 And why do they protect the patient with multiple layers when transporting, plus the negative pressure etc. and not only, say, two? See the recent article about preparations in Germany. 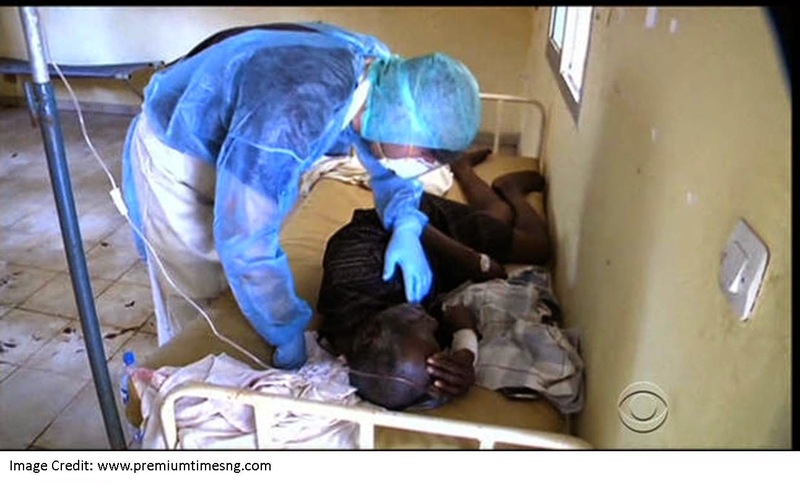 I don’t believe the problem was a failure in the established protocol,” David Writebol [husband of the infected experienced Western nurse] said in press briefing from Liberia, where his wife got the disease. “… She had prepared herself. Ditto for the other local doctors, medical heroes, some of whom have been very careful. Hi Zezen, Thanks for your question. Actually the "semantics of airborne" are quite important here, that is why the CDC guideline specifically states "droplet and contact precautions". In plain language, you must be near enough to the patient to be exposed to droplets that are not actually "airborne" (see airborne definition above), but rather move through the air by the force of the act that generates the droplet: cough, vomit etc. Unfortunately, people think they are being careful and yet it's not careful enough because you can't always see where the infectious droplets are. In these situations, infectious bodily fluids are often found where they are not expected, so people inadvertently touch something that was contaminated because they don't think it was contaminated. While I understand your concern, you can take at least some comfort in several things regarding this situation. First of these is that Ebola patients cannot spread the disease unless they are having symptoms and I imagine none of those teachers would go near anybody, much less a child, if they even suspected the beginning of an illness. Also, Ebola is not spread as easily as is say, the measles, and in a country like the U.S. with very different standards of sanitation, hygiene, healthcare and resources, it is much easier to prevent transmission. In addition, the actual risk to those teachers may have been very low to none depending on their experiences while in Africa. I don't think anyone is taking this lightly. Chances are, they simply have information that you don't have, that helps them more accurately determine the risk. My best to you and your family. You're very welcome. Please don't hesitate to ask if you have any other questions. "and this is an excellent article that really explains the different kinds of aerosols and how they are transmitted." The word 'article' is supposed to be a link, but it is malformed and doesn't work. Would you please correct that? I would like to read the referenced article. Hi! Thank you so much for stopping by and I am so sorry about the link! I fixed it and it worked from here so it should be OK, but let me know if you still have problems with it. Hi Heather - I planned a trip from PHX to DAL for my daughter's sweet 16 bday, which is this Sunday. The plan was to spend 2 days (18th and 19th) at Dallas ComicCon in Irving. With the recent developments in DAL (2nd person diagnosed), in addition to the inaccurate info from the CDC and Hospital involved in Mr. Duncan's care, my husband and I are in agreement that there are too many unknowns and we shouldn't risk exposure in case this "mutates" and becomes airborne. My daughter of course is heartbroken at the prospect of us cancelling her trip. With so much "group" activity (airports, airplanes, convention center) I feel it's best to not take any chances, esp considering my daughter has Early Onset Adult Polycystic Kidney Disease. Doesn't Ebola attack the kidneys? I've read your site regarding the Ebola facts / risks and I guess I'm still confused at to how likely it is to catch this virus vs. being, say, struck by lightning (!) Your thoughts? Hi, and thank you so much for reading and for asking this question. I completely understand your fear and hesitation, especially with an already susceptible daughter. First let me say that there have been no symptomatic Ebola patients on flights coming to the US and Ebola patients really are not infectious - cannot spread the disease - unless they are showing symptoms, and this is why there are screens at airports (to keep people with symptoms off of planes - preventing their migration to other countries during incubation is a bonus but not guaranteed). I don't know what the stats are on lightning strikes but the only way you could catch Ebola on a plane from Phoenix to Dallas is if there was an Ebola patient with detectable symptoms on the flight AND you got some of his or her bodily fluids in a mucus membrane or open wound. Mr. Duncan had no symptoms on the plane, or even the next few days, so there is no way the plane was contaminated in any way from Mr. Duncan. It's very hard to catch Ebola. And as of yet, none of his close contacts under surveillance have shown any symptoms and the 21 incubation period will end on Monday. Health care workers are at high risk because as the patient gets sicker, they need more care and have a lot of terrible symptoms that spread the virus. As for your trip, you have to do what you're comfortable with and there's no shame in erring on the side of caution if that's what you feel you need to do. I recognize that those without my training and understanding of the virus have a different perspective and that's OK. If it were me, I would go ahead with my plans. I hope this helps.